If you’re looking to mix up your wardrobe, the easiest way to do it without breaking the bank is with Showpo tops. The womenswear label designs a range of T-shirts, blouses, crop tops and camisoles that will see you through work, nights out and relaxed days on the weekend. 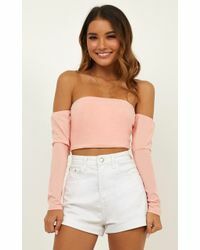 Each top, whether smart or casual, is injected with the label’s signature style, so expect fun, flirty and fashion-forward styles in this selection.